An incongruous alteration in the flow of blood in the form of steal syndromes is a well-known complication of coronary artery bypass grafting (CABG). It might be discovered incidentally, that is during an ultrasonographic or angiographic examination performed for any other indications, or during the clinical examination, finding of reduced blood pressure or unilateral upper-limb pulse. Treatment mostly comprises of open subclavian artery revascularization, normally via carotid-subclavian bypass or subclavian artery transposition, and new less invasive options which are endovascular intervention with recanalization, angioplasty with stenting if needed. Coronary Subclavian Steal syndrome is a rare complication of coronary artery bypass graft. It mostly occurs due to the stenosis of the left sub-clavian artery which is proximal to the left internal mammary artery, compromising of the myocardial blood flow. It is mostly the result of a long-standing subclavian stenosis occurring due to the progression of the stenosis following Coronary artery bypass graft. Coronary artery disease (CAD) and peripheral artery disease (PAD) exhibit a very high prevalence rate and there is an increased morbidity and mortality of these diseases in the western world. Patients having a history of coronary artery disease (CAD) and an earlier coronary revascularization, in this case, angina pectoris, are usually attributed to the progression of atherosclerotic lesions. Etiologic factors which can lead to steal syndrome include proximal subclavian artery occlusion or severe stenosis. In the majority of cases, it is the result of atherosclerotic arterial disease, which mostly has dominance for the left side. On the right side, disease or occlusion of innominate artery can result in occlusion of the origin of subclavian artery. It occurs by the shunting of the well-oxygenated blood from a critical area of low perfusion to an area of low perfusion. It is unique as it may be iatrogenic and can occur in the pharmacologic stress imaging, by using dipyridamole to induce vasoconstriction. This will lead to a fall in the blood flow to the subendocardium distal to the site of the stenosed coronary artery. In severe proximal subclavian artery stenosis or occlusion, insufficient blood flow may be present to withstand the ipsilateral arm and may result in low pressure in the distal subclavian artery. In this case, branches of the subclavian artery may get engaged to provide collateral reverse flow to the upper limb. Reverse flow of blood in the vertebral artery assists as a collateral artery for the arm in this condition. Through exercise, distinctive and metabolite-induced vasodilation leads to a drop in peripheral resistance in the upper-limb vessels. The gap between arterial inflow and the metabolic demand may result in arm claudication. Additionally, when there is an increase in the retrograde flow through the ipsilateral vertebral artery, it may “steal” blood away from the cerebral circulation. This syndrome is mostly characterized by a retrograde flow of blood from the Left Internal Mammary Artery (LIMA) to the left subclavian artery (SA) when a proximal left SA stenosis is present. Coronary Subclavian steal syndrome is mostly asymptomatic. 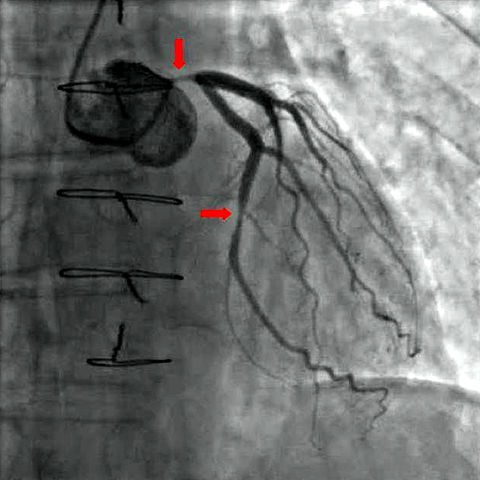 Coronary Sub-clavian Steal syndrome is always suspected in patients who have complain of recurrent angina pains after having undergone coronary artery bypass graft with an ITA. All these patients should have a bilateral pre-operative blood pressure measurement done. Placement of a clip on the anastomotic channel or on the bypass of the channel with a vein graft in order to induce occlusion. Ipsilateral transient ischemic attacks (either hemispheric or ocular) in patients with ipsilateral internal carotid artery occulsion and severe stenosis of the external carotid artery. Monocular amaurosis fugal in patients with ipsilateral internal carotid artery occlusion and a micro embolic source in the external carotid artery origin or the occluded carotid sinus. With the lack of any of these criteria, it is unambiguous for the patient to avoid undergoing a major surgical procedure. Proximalization of the Arterial Inflow (PAI): This method will help in enhancing the access flow. Distal revascularisation –interval ligation (DRIL): This is a complex and time-consuming procedure. It is mostly possible when a suitable vein can be harvested. Long-term patency is tremendous, with nearly 90% of patients being free of restenosis at 4 years’ time. Long-term patency is approximately 94–97% at 20 months. Endovascular approach with Percutaneous Transluminal Angioplasty (PTA) and stent placement in the subclavian artery has a very high success rate (80–100%) with close to 0% mortality rate. Most of the complications are attributed to the distal embolization and they mostly occur in 3–6 % of cases. Takach TJ, Reul GJ, Duncan JM, Krajcer Z, Livesay JJ, Gregoric ID, et al. “Concomitant brachio-cephalica and coronary artery disease: outcome and decision analysis.” Ann Thorac Surg. 2005; 80(2):564-9 2.